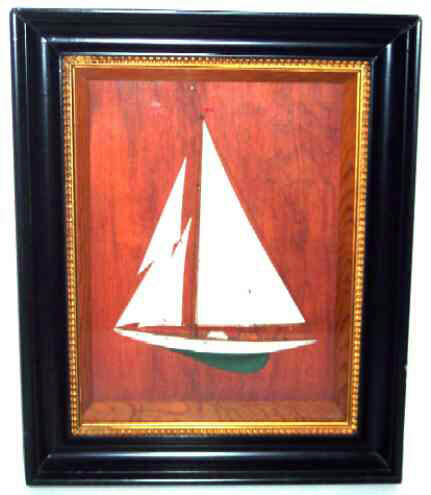 Presented here, a very fine Sailboat Diorama in a Shadowbox frame. The hull and sails are carved from wood, rigging is intact, and a pennant is flying from the top of the mast. The whole is enclosed in a wonderful original shadow box frame with a gold liner making for a very crisp presentation, circa 1900-1920. Dimensions are 12 3/4" x 16 3/4" (sight); external dimensions are 18" x 22". Condition is excellent and original.